Fred Bowen is the author of the popular Sports Story series, a collection of middle grade novels that features exciting team play-by-play action, snappy dialogue, realistic conflicts, and engaging plots, and offers glimpses into sports history. A lifelong sports fanatic, Bowen has coached youth league baseball, basketball, and soccer. His kids’ sports column “The Score” appears each week in the KidsPost section of The Washington Post. In addition to providing more information about his newest book in the Sports Story series, Lucky Enough, Fred Bowen answered some questions to explain the importance of youth sports for children and the life lessons and character skills that can be learned through both playing sports and reading sports fiction. Q: You’ve dedicated over twenty years to kids’ sports—both as a coach and as a Washington Post sports writer for kids. Why do you think sports are important to children? A: I think kids love sports because they own the experience. When a kid scores a goal or makes a basket, it is their accomplishment. A parent or some other adult did not arrange that for them. That is why I think so many parents are nervous at their kids’ games. They are not in control. Their child is in control. It’s the kid’s game and that is why they love it. Q: You’ve mentioned before that youth sports should be more about character education than mastering specific sports skills. What are some important character lessons that children can learn through playing sports? A: There are so many important lessons kids learn from sports that it is hard to list them all. But some of the most important include giving your best effort at all times, being a good teammate, and dealing with the inevitable disappointments of the game. If a child can learn these lessons from sports they may be able to apply them to their schoolwork and the rest of their life. Some of the lessons are really hard. For example, lots of times in sports you try your hardest and things do not come out the way you had hoped. That’s a tough one. All the lessons listed above are in my books along with many more. All of them are important for kids to learn. Q: You said in a past interview, “So many kids are passionate about sports, and I like tapping into that passion to show them how much fun reading can be.” What did you mean by that? A: Kids love sports. I have spoken at hundreds of schools and I always ask, “Who plays sports?” Almost every hand flies into the air. My goal through my books is to turn that passion for sports into a passion for reading. Kids will read more if they are allowed to read books that are about subjects they like. Q: How do you think reading fictional stories about sports can supplement the character development and learning that happens in playing sports? A: The kids love the books. And that is because my books, like all good fiction, have characters that the reader can care about. I try to make the main character in my stories a “regular” kid so most of my young readers can readily identify with the problems the character is facing. In that way, the books always have an emotional center that captures the reader. Q: How did you get interested in writing about sports and sports history for children? A: When my son Liam was around 6 years old I read him some kids sports books. I didn’t think the books were very good. I thought I could write better sports books than the ones I was reading. So I gave it a try. My first attempt was not very good and was never published. But I was learning and getting better. Then I wrote T.J.’s Secret Pitch. That was published in 1996. Since then I have had 22 more books published with more to come. The history part of the books was a natural fit. I have always loved reading history and studied history at the University of Pennsylvania (PENN). I am lucky there is so much interesting history in sports. Q: Your series includes books about many different sports. Did you play sports growing up? Do you have a favorite sport? A: I played lots of different sports as I was growing up even though I wasn’t a great athlete. I just loved playing games and being active. I played baseball, basketball, football, tennis, street hockey and I also rode my bike a lot and did some sailing. In high school, I played soccer and golf. In fact, I still play golf. Q: What inspired the story in your newest book, Lucky Enough? I noticed the sign one day and started thinking about the connection between luck and gratitude. We sometimes think of luck as a way to get the things we want. But as the sign implies, there is also a part of luck that can make you feel grateful for what you have. Q: Your books always include a "Real Story" chapter about sports history. How did you choose what information to include in your “Real Story” chapter for this new book? A: The real sports history chapter is always related to the story in the book. 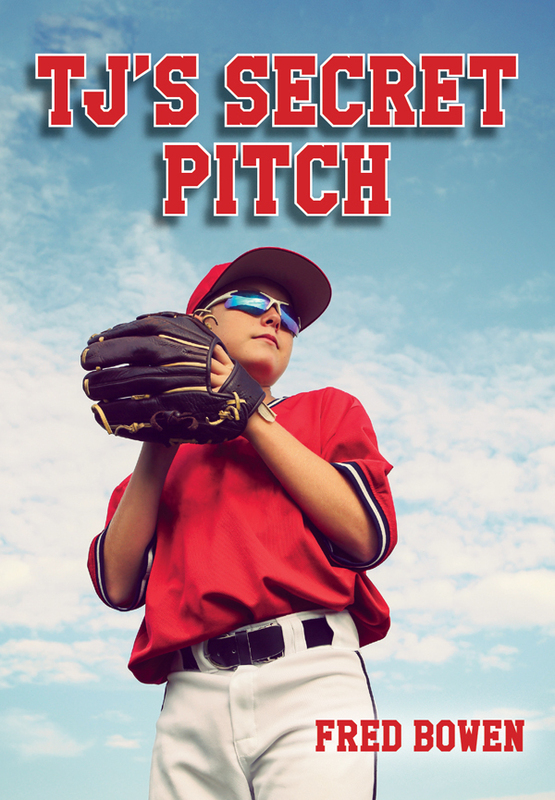 For example, Lucky Enough is a story about a young player who believes a piece of blue sea glass he found with his grandmother is lucky and will make him a better hitter, fielder and even student. So the sports history in Lucky Enough is about famous baseball players and their superstitions. But, as I point out, these players did not count on their “lucky” bats or hats. They also worked very hard to become top players. Q: What can children who read Lucky Enough learn from Trey’s experiences and struggles with superstition in baseball? A: All games are a combination of luck and skill. In baseball, for example, a lazy popup may fall in for a hit while a scorched line drive may find a fielder’s glove. It is easy for kids such as Trey to believe they need a lucky charm or a certain bat to be good at the game. In the long run, however, any player needs to work and practice to become their best. That is another important lesson that playing sports teaches. Find Lucky Enough and the rest of the books in the Sports Story series at your local library, indie bookstore, or Barnes & Noble. For more information about Lucky Enough, check out our blog post and the Discussion Guide!